Known for the quality of their products, Tokyo Marui is an airsoft guns and accessories manufacturer from Japan. The company was founded in 1965 and they are the ones to pioneer the design for the AEGs we know and love today. They were the first to introduce an airsoft fun powered by an electric gearbox (in 1991) and they are the ones to create the first battery-powered AEG, the FAMAS F1 (a replica of the FAMAS, an assault rifle designed and manufactured in France starting with 1946). Tokyo Marui also designed the 3-gear AEG which is still used today and was copied by other manufacturers. 1985 – Luger P-08 was first 6mm airsoft pistol which quickly became a best-selling product in Japan. This was a cheap airsoft gun, with a full ABS body, and a spring action that didn’t shoot very far or fast. 1986 – Tokyo Marui S&W M59 GBB, the first gas blowback pistol from TM, which has a different mechanism in comparison to the GBBs we know today. Also, they launched a second pistol in the same year, the HP Browning Gas Blowback Pistol. Up to 1991 – The company stuck with producing all types of pistols and submachine guns that ran on gas or spring power. 1991 – They released the first AEG design (the FAMAS F1), which was quickly followed by an improved design, the Colt M16A1 AEG. 1993 – The first FA-MAS SV was launched, with a hop-up system, low power, and longer reach. 1995 – TM launches the more realistic and powerful Desert Eagle .50AE gas blowback pistol. With the start of a new millennium, Tokyo Marui launched their airsoft guns and accessories business and nowadays, their products are exported and known worldwide. Furthermore, some designs are so realistic that some movies even used them as props. A good example is the movie ‘The Kingdom’, where, in several fighting scenes, you can see the Tokyo Marui Sig 552 airsoft gun being used by the soldiers. As an added bonus and to show that the company members really understand the fun of playing airsoft, there is a Tokyo Marui field (called Tokyo Marui BB Sports Field), which has been operational since 2010. If you ask any airsofter about their dream airsoft gun, in 9 out 0f 10 cases it will be a Tokyo Marui design! Even though the prices are a bit steep, their guns are pre-ordered in stores all over the world, and whatever it’s left is sold immediately. So why do airsofters almost kill each other to have a TM? Now, most of their guns are quite expensive, but you get a solid warranty, so you are covered in case something goes wrong. For this section, I selected some of their most popular models and below you can read about features and specifications that may be of interest to you. A decent spring powered sniper rifle that I would recommend to beginners, the VSR-10 is moderate in power (about 260 – 275 FPS) but it is deadly accurate which is exactly what a sniper needs. The build quality is good, and the price is affordable, which is why this is considered an entry level airsoft gun. The body is a combination of ABS plastic (the stock) and metal (the barrel and the cocking lever), it features a stable hop-up that’s easy to adjust, and each shot is quite satisfying. Overall, the rifle feels and looks good, and it is designed to allow anyone a small taste of the sniping action. If you like the spray and pray approach, the AA12 is definitely a fantastic weapon for you! This impressive AES (Airsoft Automatic Electric Shotgun) is equipped with 3 inner barrels and each one can be adjusted individually so you’ll have full control of the spread. Furthermore, this monstrosity of a gun (it weighs about 4 Kg!) is equipped with 3 Cylinder Mechabox, which can shoot up to 30 BBs per second if the shotgun is in full auto mode! TM used high-quality ABS plastic for the body, but the internals are all metal for increased durability and a more authentic feel. Even if this bull of an airsoft weapon is designed for spread, it is highly accurate and shoots at about 260 FPS. I would’ve loved a bigger magazine though, as the 90 rounds one goes away rather fast. The Hi-Capa 5.1 is a powerful GBB that works with 134A and green gas (only for experienced players) and shoots at about 250-300 FPS. The blowback is close to reality and the pistol only supports semi-auto firing mode. The design is simple, with authentic markings and feels good in your hand. Now, because it resembles a real gun, it can be used with different types of holsters, which make it a wonderful sidearm. Also, the 31-round double stack magazine and adjustable rear sights make it a reliable partner in the field. One of the reasons Tokyo Marui is so popular is the badass design of their airsoft weapons! Let’s take the P90: this is a highly-compact AEG, with a version 6 gearbox and a trans-mounted motor that will make everyone drop their jaw on the field. Besides the tough design, the rifle has a magazine with fake rounds mounted on top. And if this is not enough, the RIS rail allows the user to install all sorts of accessories. As you can imagine, the body is both ABS and metal and the accuracy is spot-on. The P90 supports semi and full auto firing mode shoots at about 265 FPS and carries a magazine with 68 rounds. TM recommends a 7.4v with Small Tamiya battery, but you can use other designs if you feel adventurous. This one is a classic adaptation of the popular MK23, the TM design is equipped with a fixed slide and a metal silencer (due to the special threading of the barrel, only KSC branded SOCOM silencers will fit). The look is impressive, and you know the pistol will be with you for a long time because there are no moving parts that could break (due to the fixed slide feature). The pistol also features adjustable hop-up and uses green gas as fuel. It can shoot at a speed of 330 FPS, it holds a magazine of 28 rounds, and it is a rather large sidearm. A loyal replica of the well-known real-steel gun, the TM Glock 18C is one of the smallest platforms that feature the auto and semi functions. 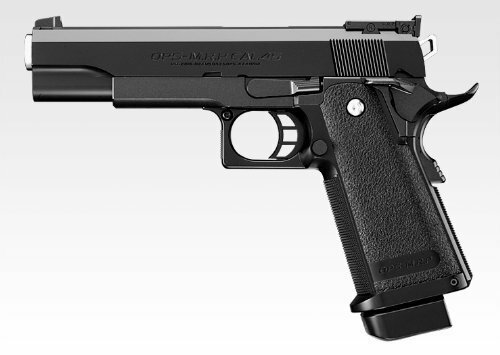 The pistol is lightweight but durable as the body is high-quality ABS plastic and the internals are metal. This is a gas-powered design that has the authentic Glock markings for a more realistic feel and look. 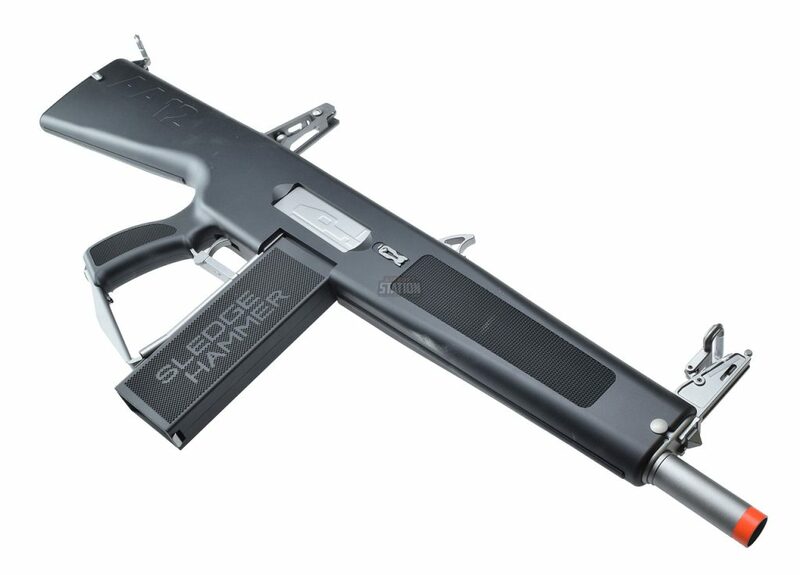 It’s also equipped with adjustable hop-up (you can only reach it through the slide) which make it one of the most accurate pistols on the market. While it’s not very powerful (295 FPS), it does have a bit of recoil, which is why I wouldn’t recommend it for an absolute beginner. Another cool replica of a real-steel pistol (the Glock 17), this GBB is fueled by gas and has removable phosphorescent sights, which allow you to use it in low-light conditions. The pistol has a rather low range (45m) and can only fire in semi-auto mode, but it gets to 295 FPS and has an adjustable hop-up for improved accuracy. Overall, the TM Glock 17 makes for a great sidearm, especially for someone who is just starting to wrap their mind around the game. Still, you should watch out for that recoil! Designed for advanced players, this badass GBB is a fantastic addition to anyone’s collection. It is big, heavy, and feels good when you grip it in your hand. It also provides plenty of space around the trigger guard, so you can use it with gloves. The pistol has only full-auto firing mode and you can adjust the accuracy using the integrated hop-up. Overall, the design is impressive, with a combination of ABS and metal, and accepts both 134A gas and green gas (for experienced players only). This bad boy shoots at about 270 FPS, packs realistic blowback action, and has an insane rate of fire (up to 25 rounds per second)! As you can imagine, it’s not a good fit for a beginner, but it will become a fire-spitting beast in the hands of an advanced player.